With cutting-edge innovation and a history of quality performance, Winchester delivers the ultimate duty round with their .40 Smith & Wesson Ranger ammunition. Designed to meet the demanding requirements of law enforcement personnel, this ammo delivers maximum penetration through the toughest urban barriers, especially auto glass. Each of these 50 rounds is loaded with a 165 grain bonded hollow point projectile. Featuring a proprietary core/jacket bonding process that bonds the copper jacket to the lead core and an enhanced hollow point cavity, these projectiles offer maximum weight retention and enhanced expansion. The result of this unique bullet design is a broad, deep wound channel which delivers effective energy transfer and catastrophic tissue damage. This new production ammunition is boxer primed, non-corrosive, and brass cased. 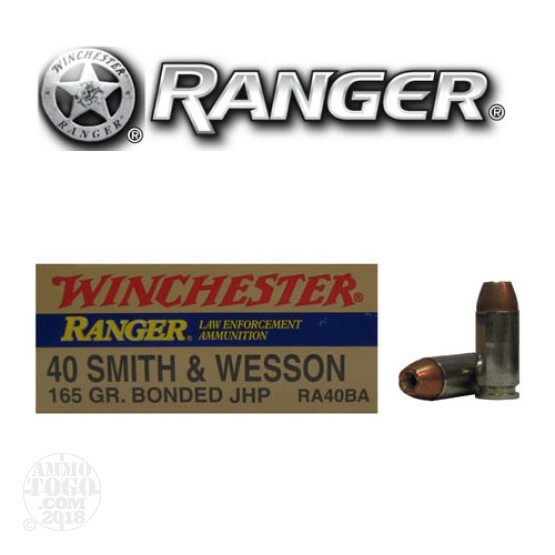 Leaving the muzzle at a velocity of 1140 feet per second with 476 foot pounds of energy, this Winchester Ranger ammunition is ideal for personal protection, home defense, and concealed carry.